Einhänder (アインハンダー?) is a scrolling shooter video game developed by Square for the PlayStation console. It was released in Japan on November 20, 1997 and in North America on April 30, 1998. It was also re-released for the Japanese PlayStation Network on June 25, 2008. 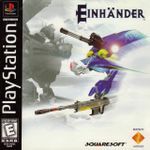 The name Einhänder is German for "single-handed", a reference to a sword, here used to refer to the single manipulator arm possessed by the player's spacecraft. The game is set in a fictional future during a war between the Earth and the Moon. The player is part of the Moon's forces and must invade enemy territories to gather reconnaissance and enemy weapons. The music of the game was composed in electro/techno style by Kenichiro Fukui and was published in Japan as a soundtrack album. The game received positive reviews from critics, who praised its gameplay and graphics, but felt the game's short duration and lack of two-player mode were minor flaws.